AFRICAN AMERICAN REPORTS: Brandi Shakir is missing! 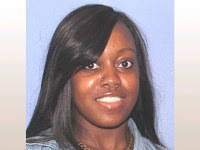 OAKWOOD VILLAGE, Ohio-- Oakwood Village police are searching for a missing 23-year-old woman. Police said they believe Kyle Johnson, 25, abducted Brandi Shakir Monday morning. He is considered armed and dangerous. It's believed Johnson, who is Shakir's ex-boyfriend, set the house she was staying at on fire, then took her. According to Oakwood Village police, Johnson assaulted Shakir last week, leaving her with two black eyes and a fractured eye socket. Police say Shakir had a protection order in place against Johnson following that attack. Johnson was last seen leaving Oakwood Village at about 10:35 a.m. driving a 1999 black Acura with Ohio license plate EXV6585. It may have damage to the front passenger side. Shakir was wearing green scrubs, a white T-shirt, a Pandora bracelet with purple charms. Anyone with information should call 440-201-1008 or 911.